With the holidays upon us, there’s a lot more shopping going on, whether online or otherwise. With more online traffic comes more opportunities for hackers to steal personal information from those taking advantage of the convenience of online shopping. Protect your computer. Install a firewall, anti-virus and anti-spyware software. Check for and install the latest updates and run virus scans regularly. Check a site’s security settings. If the site is secure, its URL (web address) should start with “https://.” You also may see a picture of a small closed lock in the lower right hand corner of the screen. Shop trustworthy websites: Look for the BBB seal on the site and click to confirm that it’s valid. BBB dynamic seals will take you to a site’s BBB Business Review. You also may find the review at www.bbb.org. Beware of too-good-to-be-true deals. Offers on websites and in unsolicited emails may offer free or very low prices on hard-to-find items. There may be hidden costs or your purchase may sign you up for a monthly charge. Look for and read the fine print. Beware of phishing. Legitimate businesses do not send emails claiming problems with an order, account or a package to lure the buyer into revealing financial information. If you receive such an email, the BBB recommends that you pick up the phone and call the contact number on the website where the purchase was made to confirm a problem. Pay with a credit card. Under federal law, you can dispute the charges if you don’t receive an item. Shoppers also have dispute rights if there are any unauthorized charges on the card, and many card issuers have zero-liability policies if someone steals and uses your card number. Check your credit card statement regularly for unauthorized charges. Never wire money. Keep documentation of your order. Save a copy of the confirmation page for orders or emails confirming the order until you receive the item and are satisfied. Be sure to know and understand the return policy and keep this documented with your purchase records. Obtain a tracking number for shipments. If you need the product before the holidays, find out when the seller intends to ship it and if possible, how it will be shipped. The tracking number can help you find a lost order. Ever feel like your internet connection is really slow? This was the case for me at home last night. You try restarting your computer, you try restarting your router and modem… basically you restart everything and anything connected to your computer. When nothing improves, this is your next step: check your internet speed. That way you can determine whether you are really getting the upload/download speeds that you’re paying top dollar for. There are plenty of test sites out there, but the site that my household uses is http://www.speedtest.net. All you have to do is go to the site and click Begin Test. It will then tell you your download speed, followed by your upload speed. After that, you can determine whether to face your internet provider’s tech support line to get the speed that you are paying for. September 1, 2015: Hey Siri! Enable the hands-free mode that allows you to talk to Siri without needing a push of any button! As long as your iPhone is plugged in to a source of power, you could converse with Siri as you normally would by starting with the phrase “Hey Siri”. Step 1. Dial *3001#12345#* and press the call button. This will put your phone in Field Test mode. Step 2. Hold down your power/lock button until the phone goes to the ‘power down’ screen. Then press and hold the home button for about 6 seconds. This will take you back to your home screen and you can see that your signal strength is now shown in numerical value. You could switch back and forth between the bars or the signal strength in dBM just by tapping on it. The higher the number, the stronger the signal. The numbers shown are negative numbers, so five bars could represent -40 to -77 and one bar could represent -102 to -120. July 21st: Trash, and how to make sure it’s really gone! We’ve all done it. We drag a file to the trash or recycle bin, then we go to Finder>Empty Trash on a Mac, or we right click the Recycle Bin and ‘Empty’ on a Windows machine. WELL TAKE NOTE: This does not delete your files. This marks them as files that can be overwritten, but they aren’t gone. In Mac, you can go to Finder>Secure Empty Trash, which automatically overwrites your files, and then marks them so that they can be overwritten AGAIN. This is much more complicated in Windows, and would require an outside application, like AVG File Shredder. But why? Why does this fix so many different things? 1. Frozen Computers are occasionally caused by memory leaks. Rebooting a computer pulls all the memory back from every open program, and gives it the opportunity to redistribute it in a more efficient manner. 2. Other problems with computers are usually errors. These errors are wiped out when you reboot a computer. Some errors will happen again, there’s no way around that. However, many will be resolved, which is why it is often the first line of defense for an IT person. Keyboards can get absolutely disgusting if not cleaned regularly. 1. UNPLUG or disconnect your keyboard before cleaning. You don’t want to accidentally type in a command that you didn’t mean to. 2. Used compressed air to blow the gunk out from underneath the keys! You can also use a vacuum, but make sure it isn’t going to pull up any keys. You can also use a soft bristled brush, though it isn’t as effective. 3. Use isoproply alcohol to rub down the keys, using a cloth or a Q-tip. Isopropyl should not remove any lettering. Cinco De Mayo! Bigger is Better! Having trouble seeing these websites? You can enlarge the text on any page by hitting two keys. In Windows, press the Ctrl key and the plus or minus keys (for bigger or smaller). In Mac, it’s the Command key and plus or minus. 1. Use pretty much any device except a desktop. Most desktops are huge energy hogs. Use a laptop or tablet. 2. Settings! Yes, you can set your computer to save you energy. Specifically in the areas of brightness and sleep mode. Many computers will show you the optimal levels you should be at. 3. If you still have a CRT monitor (WHY?! ), ditch it. The flat screens will pay for themselves in energy savings. Of course, you really should just grab a laptop if your goal is to save energy. 4. Turn your computer off at the end of the day. It’s a myth that powering it back on takes more energy than it just sitting there in sleep mode. It’s amazing how much information people are willing to give out over the phone. Always, ALWAYS, confirm who you’re speaking to, especially if the person on the other end of the line is asking you technical or logistical questions about your workplace. If it is someone claiming to be from ‘corporate’ or from ‘IT’, tell them you will call them back to confirm their identity. Call them back on a number that you know is correct. Do not assume that a number they give you is correct. When in doubt, always be skeptical. Ao let’s say you have extremely different views on religion or politics than your friend Joe does. You don’t want to see his Facebook posts, but you don’t want to unfriend him. Visit Joe’s profile & unfollow them there. Just click on their profile pic, go to their profile page. You’ll notice up left where it says that you are friends, it also says you are “Following”. Click on it, and you will no longer see their posts pop up on your newsfeed. However, you will be able to go to their page as a friend still. You can also do this by clicking the upside down carrot next to one of their posts. It will give you the option to unfollow. Okay, we know that you trust your brother. However, your brother trusts his buddy, who trusts his sister, who trusts her boyfriend. Suddenly, someone’s ex-boyfriend is logging in to your network and stealing your info, or infecting your systems. It could even be more innocent than that. Your trustworthy brother could accidentally click on a random site while on your business’s WiFi(which may connect to your PoS systems, as an example), and suddenly you’re…effed. This is known as “access creep” and can be a major threat to any organization. When that really cool guy’s “bro” winds up with access to your industry-changing plans or PoS system, your business could face staggering losses. Step 1: Make a guest WiFi, to keep business operations and customer browsing separate. Step 2: On public facing computers, set up a guest account, so that no sensitive data can be accessed. Step 3: Check on these accounts regularly to make sure they still have the correct access level and cannot reach sensitive or compromising data. Step 4: Deploy an Adaptive NAC to handle guest accounts, guest networks, and access creep. Ever tried to read something on your phone, laid down, and discovered your phone flips orientation? Annoying! Locking your screen orientation can be done whether or not your phone is locked! It does need to be awake though, so at least hit your home button once. 1. Swipe from the bottom. 2. A greyish screen should pop up! You are looking for a symbol of a lock with a circle around it that ends with ann arrow. CLICK IT! Now your screen orientation is locked. Click it again to unlock or change the orientation. 5. Interestingly, charging your battery to 100% and then letting it run until it dies once a month, is good for it! In a *nix environment, typing “sudo ! !” in the command line will run the last command issued as root. Time Saver! Let’s say you’ve dragged an item to the trash, and emptied it. It’s gone, right? Nope! Trashed files can be recovered using data-recovery software. Want to make sure that it’s really gone? Use ‘Secure Empty Trash’. This way they are completely overwritten by meaningless data instead of waiting to be overwritten when space is needed. Drag the item to the Trash. Choose Finder > Secure Empty Trash. When you see a warning message, click OK. Okay, this one is pretty obvious. 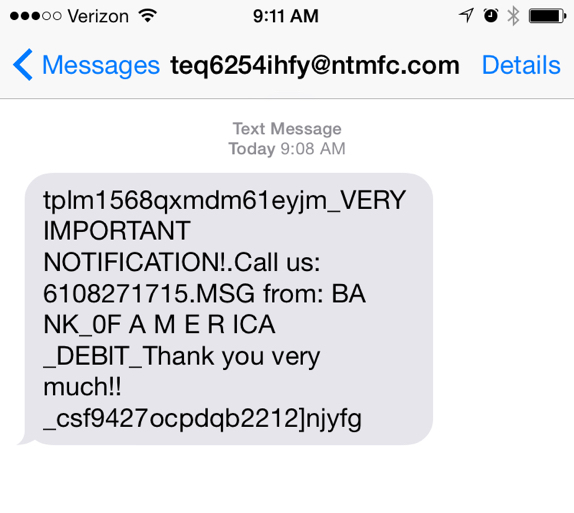 In what world does Bank of America send a text message from teq6254ihfy@ntmfc.com? However, Phishing scams aren’t always obvious. Sometimes they look so real that you aren’t sure whether or not to believe them. In fact, sometimes they looks so real that you don’t even wonder. You just follow the instructions. It’s time to be AWARE: If you get a text message, email, phone call from your bank, the IRS, Facebook, ANYTHING requesting you to contact them or send them sensitive information, don’t do it. No ifs, ands, or butts. Just don’t. 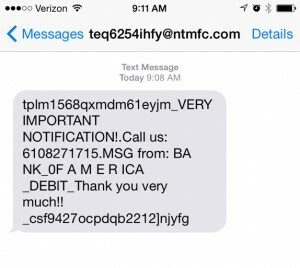 However, if you think the message might be the real deal, contact your bank, the IRS etc. Just don’t do it through the contact information that the message gives you. Look up your local bank branch online, or check the back of your debit card for a number. Call and confirm before following any instructions. Phone calls from people claiming the IRS is building a tax fraud case against you. Emails from Anthem(or any recently breached company) needing your info to check if you’ve been breached. ANY email that wants your information. Never reply to these. Go find the direct email on the site of the organization emailing you, and confirm that it’s them. Want to know the definition of a word without having to visit Dictionary.com? Place your mouse cursor over any text and press Command + Control + D to get an informative pop-up menu that includes, definitions, similar words, and Wikipedia links! Did you know you can test a power supply with a paper clip? All you have to do is stick the paper clip in to pins 15 and 16. If the power supply is good, the power supply cooling fan will turn on. Pin 16 is only +5V and harmless to touch. Let’s go over functions of the F keys located at the top of the keyboard! First off, these keys are the function keys. When pressed, they each tell the operating system command interpreter, or an application program, to perform different actions depending on which one you choose. F4 repeats the last action performed in Word document, or opens up the address bar in Internet Explorer. Holiday shopping season has arrived, and the bad guys know it! Today’s tip is to use a service like Paypal, GoogleWallet, or Prepaid Debit cards. Why? They’re far more secure! 1. A lot of these services, like Google Wallet and Prepaid Debit cards, only allow money that’s been added in to the account to be spent. 2. While these accounts can be linked to your bank account, they aren’t your bank account! It provides an extra layer of protection. 1. Eliminate small extraneous words like “to,at,the,it” when searching. For example, instead of “Where is Disneyland at?” You really could just type “Disneyland”, and you’ll be given the same, and probably better, information. 2. If you want to calculate something, just dial it in to Google, instead of looking for a calculator. Try typing in “5 liters +3 gallons=” instead of looking for “liquid conversion calculator”, and then having to type the math in later. 1.When using public wifi, avoid doing anything HUGELY important, like banking. Just wait until you know you’re on a secure connection for things like that. 2. If you must use login sites like Facebook etc. while on public wifi, only send personal information to websites you know are fully encrypted. It needs to say “https” on every page. If you think you’re logged in to an encrypted site but find yourself on an unencrypted page, log out ASAP! 3. If you’re browser alerts you about a fraudulent website or download, pay attention and get out of there. 4. Change the settings on your mobile device so that it doesn’t automatically connect to nearby Wi-Fi. That way you have to make a decision about every wifi. 5. Only use public wifi labeled WPA2! September 30th, 2014: The Importance of Updates! 1. Updates solve problems like bugs in software. Which is more annoying: your app constantly crashing, or sitting through the update process? Every person must answer this for themselves. 2. Updates protect you from data breaches, malware, viruses, identity theft, etc.! This is a biggie! Updates tend to include security patches. Isn’t not losing all of your money worth the update time? September 16th, 2014: Let’s go Phishing! Phishing! It’s a serious problem. What is Phishing?? The Wikipedia definition: Phishing is the attempt to acquire sensitive information such as usernames, passwords, and credit card details (and sometimes, indirectly,money) by masquerading as a trustworthy entity in an electronic communication. How do you avoid it? The simplest way is to verify them. If an email is asking you for anything: a password, credit card info, to update any of the aforementioned stuff, verify it! Do NOT verify it by using any contact numbers within the email. Find a contact number independently, and phone the institution. Is this foolproof? Well, no, but it’s leaps and bounds better than trusting email. Do not click on anything without knowing where it’s from. Just don’t take the chance. 2. Select New Incognito Window. Note: You can also use the keyboard shortcuts Ctrl+Shift+N (Windows, Linux, and Chrome OS) and ⌘-Shift-N (Mac) to open an incognito window. Any passwords or username, no matter how complex, can be cracked. The benefit of a two-factor authentication is that even if someone has your login information, they still need that second piece of the puzzle. This piece is either something you have(a random security code sent to your phone), or something you are (thumbprint, retina scan etc.). If any services you are using offer 2FA, you should utilize it. It puts a stop to brute force hacking, and severely limits any other types of hacking. It is incredibly important to know who is on your network, when they’re on, what they’re doing, and from where. Many businesses, such as Target, Albertson’s, UPS, and Michael’s have been hit with data breaches in the past year. All breaches that could have been prevented by Network Access Control. There are two different kinds of network access control: out of Band and Inline. You want Inline! Inline sits in between your network and possible attacks or malware that could be prevented from inside your organization. For more information go to miltonsecurity.com. 1. External Hard Drives – If you can back up to an external hard drive daily, that would be awesome. If you could do it even more often, that would be amazing. Try to keep your hard drive in a separate place than your regular machine. 2. Online or “Cloud” storage: This is usually a paid service, so make sure you keep on on your payments.Check out Dropbox and GoogleDrive storage. If you are staying at a hotel running Blackhat Defcon or BSidesLV, keep your Bluetooth and Wifi off! This week is a hacker’s paradise, and they are looking for some fun at anyone’s expense! Scrolling down one page on a website is as simple as hitting the space bar! Think of the few seconds you save from not reaching for your mouse and adjusting to where it needs to be before you begin to scroll. Hitting the space bar will scroll you down exactly one page. Shift-Space will scroll you up. Disallow Admin access to the Wi-Fi. You have to wire up to change things, but it makes it harder for hackers to break in! Use Snopes.com to check your amazing news story so that you don’t look like a dunce.